Sea, Sand & Sky: Green Crabs and Spider Crabs! Green Crabs and Spider Crabs! All of last week I got the opportunity to attend the Children's Museum with Sheuli and then Community Boating after. Some days the Museum didnt have much kids and other days it did. On days where it was well populated, every child passing wanted to stop at our touch tank to view the Green Crabs and Spider crabs. Some kids fished with us, even if nothing was caught, but more kids liked crab trapping better. 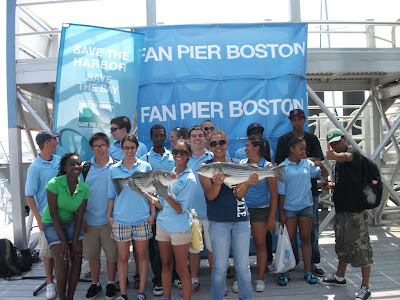 Later in week, the staff members and I took part in a race of who could catch the biggest fish - Save the Harbor's Fishing Tournament! Diana was one of the winners-- congratulations to her. The team I was on went far out of the Harbor and into the open ocean nearly, so we could fish. The experience was all new for me, but I liked it more than I expected. After a long morning we were treated to lunch and ice cream. Can't wait to see what next week holds! 27 Fish in one Day! This Island has a Beach! One Crab, Two Crab, Red Crab, Green Crab! Not the biggest but the tastiest!!!. "My best art with Tommy and Vinh." Mystery Mussels and the Zebra Scare! Nothing Beats a Cool Gadget! It's too hot to swim? Stay Cool, Stay Smart, Stay Safe! The End of a Great Week at Courageous! Lions and Turtles and Castles, Oh My! An Artist on the Island. Are we going to Hawaii? Pier's Park Music Day... IN THE RAIN! "I shall call him Hermie"
Six weeks of internship wasn't enough!